Michael Landon Jr. continues to provide good production quality in this movie series, however, it remains his only strength. However, as our founder pointed out in his review, the editing is atrociously choppy, and you guessed it, the makeup and costuming is overdone. Landon Jr.’s attempt at historical accuracy in makeup and costuming begins to diminish in this film, and worsens in the later ones. Erin Cottrell has too much makeup on for us to believe she is living out West, and Dale Midkiff looks like he just stepped out of a spa, not a stagecoach. However, these flaws could have been overlooked if the original plot had been upheld. Where to begin? There is nothing in this plot that is remotely accurate to the book. First, the book opens with Clark and Marty in their 40’s, with adult children and several grandchildren. Marty receives a gift of train tickets to see Missie from Clark for her birthday, and the two journey there. The movie opens with Missie and Willie married with an older adopted son, young son, and baby daughter. Marty is completely absent from the film, and Clark has just arrived for a visit. Within the first thirty minutes of the film the baby girl dies, leading him to extend his trip. In the book, Missie and Willie had two young sons, and more hands than they did in the previous novel, not less (as is portrayed in the movie). I have already mentioned that Jeff was not in the book, so reinforcing this point is null. The movie plot continues with the Lahayes grieving individually for their daughter, including Erin Cottrell screaming in a field, and Dale Midkiff offering cliches as reassurance. In the book, Clark and Marty enjoy meeting Missie’s new friends and neighbors before Clark becomes involved in trying to rescue two boys from a collapsed mine. He severely injures his leg in the process, and it is amputated by a doctor-in-hiding who also happens to be Missie’s best friend’s husband. This extends the Davis’ visit and puts things back home on hold. In the movie, the plot meanders between the grieving parents, the evil rich guy, and Jeff’s forbidden love interest with no real direction or point. In short, this movie never should have been made, and it is fruitless to continue to point out it’s many flaws, for this will help no one. Recast everyone and make this a TV series. This is the best way to fix this disaster. There is not much else to say here. The cast of this film is inaccurate to the book and drags down the movie even further. (we still don’t know why MLJ didn’t think of this). There is enough content to make an entire season out of each book. As seen in When Calls the Heart, screenwriters can build an entire episode around much less! Filmmakers looking to make a historical romance TV series, look no further than this book series for content! There are no errors here, Michael Landon Jr. has a talent for creating high quality productions. This part of the film is an example to others inspirational filmmakers of how to use your budget to it’s maximum potential. As he obviously has potential as a filmmaker, there is no reason for his mistakes in the others areas of the film. This plot had potential, and there is nothing inherently wrong with Landon Jr.’s content – except that it is not accurate to the book. In some areas, he strays so far that one has to wonder if he even read the book before making the movie. The plot contains fairly believable secondary characters, humor, and a mostly realistic tale of married life. However, there are also many problems. First, Jeff and his brother are not in the book, neither are the other ‘bad guy’ characters. While this subplot was an interesting idea, it is not fully developed and is therefore unnecessary. Plus, the ‘bad guy’ characters are extremely cheesy. Second, Missie was throughout the entire duration of the journey by wagon, not just at the end. She was about seven months pregnant when they reached their destination, however, Willie wanted a doctor to deliver their baby – a fellow passenger died in childbirth on the trail and scared everyone – so he left her in town while he went on to hire hands and establish their homestead. Third, in the book, once she finally made it to Willie’s land, Missie had to live in a one-room sod house with the baby for two years before he made enough money to build a real house. In the movie, they fix up a small, already existing house on the land. Furthermore, the Native American subplot in the movie is completely fabricated and has nothing to do with the original story. Missie was not a teacher out West because there was no one to teach and she was busy surviving. She did have one neighbor, Maria, who was Mexican and had a husband and son. Maria did not speak English, so Missie taught her, and in return Maria familiarized Missie with her culture. Maria did not deliver Missie’s first son (whose name was Nathan Isaiah BTW), and that was not the only child Missie had. At the end of the novel it is mentioned that she is expecting another. Finally, there are also many instances where Missie and Willie share the gospel with those around them; this fact is completely deleted from the movie, with the exception of a few scenes where they are shown reading the Bible. Therefore, Landon Jr. could have improved this plot by using the content already written in the book, and by making this book series into a TV series, not a standalone film. Oh, just when we thought it couldn’t possibly get worse, it did. Thank God Dale Midkiff’s scenes a brief and far between. 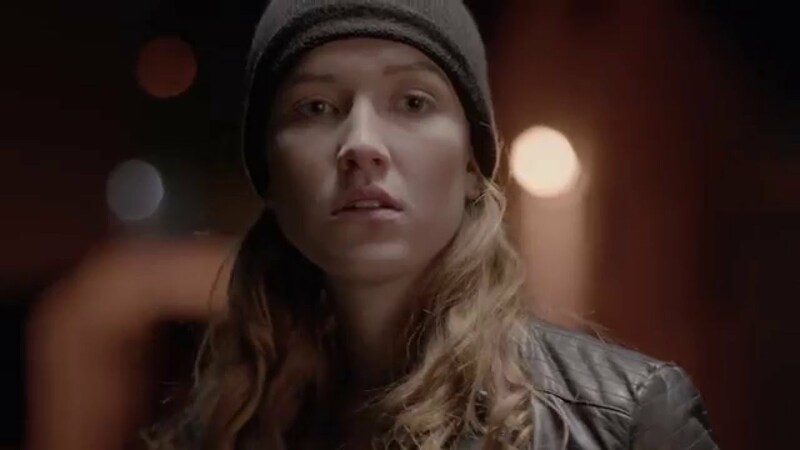 We’ll never know why Erin Cottrell was chosen to replace January Jones, the former was a better actress and had more potential, even if she was a typical Landon female lead. Cottrell drags down the whole movie. Logan Bartholomew is slightly better in this movie than the previous one, but is still his awkward self. Cookie is a walking stereotype (he wasn’t African American in the book), and Henry was not a full-grown man with a checkered past in the book, he was a boy that the LaHayes hired to drive their second wagon while on the trail. On the whole, the acting in the movie is pretty bad, and the cast needs a complete redo. However, to their credit, they don’t have anyone to tell them how to improve. Love’s Enduring Promise has great production quality, with realistic sets, a picturesque location, and great camera work. As our founder pointed out, the main issues here are some choppy editing and the usual unrealistic makeup jobs. Otherwise, this is the strongest area of the film. It is obvious that Michael Landon Jr. is a talented producer. However, as women had little to no access to makeup out West, and only took baths once a week to save water, there is work to do in the area of makeup and costuming. Additionally, after further observation of the book series’ content, I believe this book and the others should be joined together to make a TV series. I believe this is the only way all the content and the many characters could be included. In short, this book should never have been a standalone film. Where to begin? 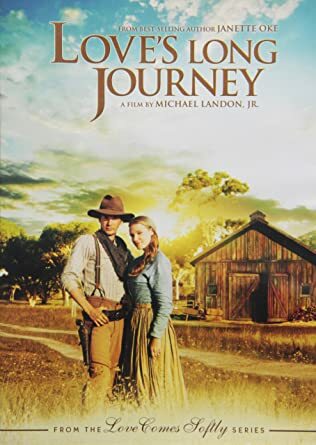 Michael Landon Jr. has drastically altered the book content in this film, so much so that it barely resembles the original story. First, he pieced together some obscure sub-plots in the final chapters of the novel – Missie went on a date with a man named Grant Thomas and eventually married Willie – and created his usual love triangle between Missie, Grant, and Willie. He purposely ignored the fact that Missie also went on dates with one of Ma Graham’s (Sarah in the movie, oh wait she’s not in this movie, another inaccuracy) sons for some time before going out with Willie, and that it took some time for her and Willie’s relationship to develop. Next, the core incident in the film – Clark cutting his leg with an axe while chopping firewood – never existed in the book. In the novel, there was an obscure sub-plot where Clark had a logging accident and cut his foot. This laid him up for a couple of weeks, but he was never unconscious or in critical condition. In the movie he has an infected limb and potential gangrene, in the book he had a cut that was stitched up, big deal. Finally, in the book Clark and Marty have three children together after becoming a real husband and wife. Arnie was one of their sons, but Landon Jr. forgot Ellie, Luke, and their adopted daughters Nandry and Clae. Nandry and Clae were adopted from a neglectful neighbor who was leaving to pan for gold and was easily convinced to give up his children. While the book content is a bit of an information dump, it would make several great episodes in a TV series. Considering that Landon Jr. has had much success with this in the past, I am flabbergasted as to why he didn’t think of this from the start. People are far more likely to watch TV than go see an obscure inspirational film. This is the main way in which he could have improved the plot and storyline quality. Again, there is so much bad here it is hard to know where to start. Dale Midkiff is a terrible actor, Katherine Heigl’s promising performance in the previous movie has declined considerably, and the child actors are grating. K’Sun Ray needed serious coaching to come off as anything but a whiny little kid, and it was not given to him. Arnie is barely in the film and has a forgettable performance at best. Logan Bartholomew is awkward and does not accurately portray the Willie character. Finally, January Jones shows potential as Missie, but delivers a mostly blank performance and needs coaching. Landon Jr. could have improved this section by giving Katherine Heigl a chance to improve, and recasting everyone else. In conclusion, because of all the glaring errors here, this movie deserves a remake. The original book content is worth it. Janette Oke should be a part of the filmmaking, especially the casting. The screenwriter should use the content in the book to create a TV series and make very few alterations. There is enough content to make an entire season out of each book. As seen in When Calls the Heart, screenwriters can build an entire episode around much less! Filmmakers looking to make a historical romance TV series, look no further than this book series for content! To start things off, Michael Landon Jr. is obviously capable of creating movies with high production quality. This being so, there is nothing glaringly wrong with this area of the film – the camera work is professional and there is a clear respect for historical authenticity present throughout. As our founder pointed out in his original review, the only issues here are a commonplace soundtrack that adds virtually nothing to the story, and an average editing job. 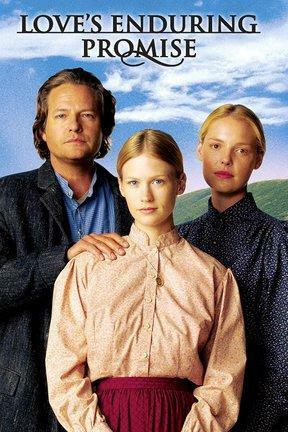 To remedy these issues, the filmmakers should have followed the already complete (and well-done) editing job found in Janette Oke’s book, Love Comes Softly (yes, this movie is actually supposed to be based on that story). Furthermore, they should have invested in a proven editor who had done an above average job in the past. Otherwise, there is nothing to be ashamed of here, thus making production the strongest element in the film. If I was being generous, only about fifty percent of the content in this movie is accurate to Oke’s book. For example, the first couple of chapters in the novel clearly state that Marty’s husband’s name was Clem, not Aaron, and Missie turned two years old halfway through the book. In the movie she is at least ten. Sadly, this is the first of many errors. While Landon Jr. kept the basic idea of Marty and Clark’s relationship, it is like an empty shell with no heart. For starters, the dialogue between the two in the movie pales in comparison to the humorous and realistic interactions found in the book. The characters in the movie are somewhat stiff with rare displays of emotion -and the displays that are there are exaggerated and rather annoying – while the characters in the book are deep, complex, and human! Furthermore, Landon Jr. rejected the original plot structure for a simple tale that is similar to all his historical romance films. For instance, in the book Marty could not leave with the first spring wagon train because Missie caught the measles. In the movie, she left with the first one. In the book, Marty’s son Claridge (NOT AARON) choked on a button and had to be rushed to the doctor, and it was following this incident that Marty and Clark became a real husband and wife. In the movie, Clark chases after her wagon on horseback and throws out a cliche as his reason for leaving Missie alone at home: “A man loses his woman, he goes after her.” And because I’m on a roll, the original agreement between Clark and Marty was that she would establish a relationship with Missie, then take her and Claridge back East in the spring. In the movie Missie did not leave with Marty. Finally, as our founder pointed out in his review, Landon Jr. had no excuse for any of these errors, because he had both the budget and the run-time to use the original book content. The plot in the book relied on it’s deep and well-rounded characters, however, this was not the case in the movie. Let’s be honest, the only reason people watched this movie is because it had a familiar actress in the lead role and good production quality. This brings me to my first point. 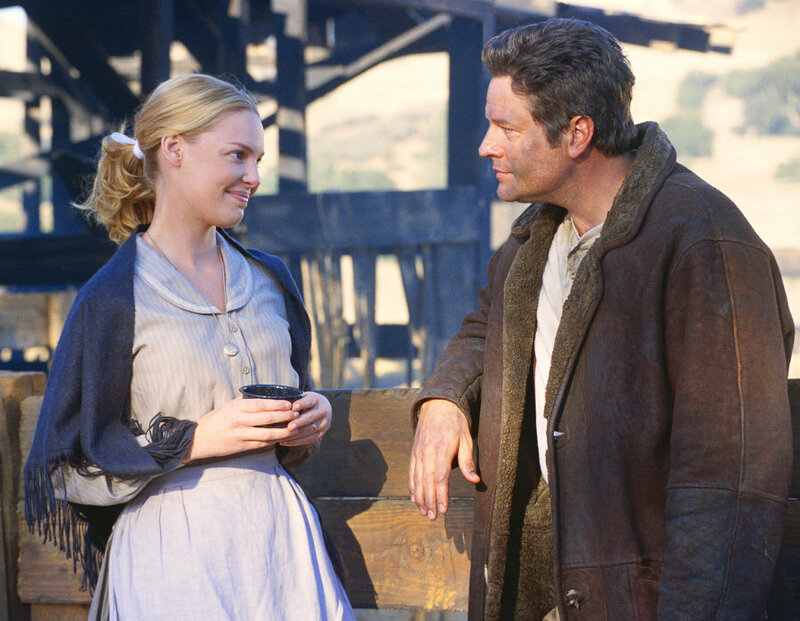 While Katherine Heigl is a fairly good choice for Marty, she does not meet her full potential under Landon Jr.’s tutelage – he only works with meek and air-headed female leads. Secondly, Dale Midkiff has to go. period. The Clark Davis in the book was twenty-five, maybe thirty. Clark in the movie is, by all appearances, at least forty.. For this and many reasons, he needs to be recast. Thirdly, Theresa Russell is a terrible choice to play Ma Graham. Oh, you did not know that was her name? This is no fault of yours, in the movie her name is Sarah Graham. Ma Graham was at least fifty when Marty met her, and had thirteen children (a blended family). Sarah/Ma in the movie is shallow and always spouting inspirational cliches in times of difficulty. Ma in the book is a fountain of wisdom and spiritual depth. Fourthly, Corbin Bernsen is not a bad choice for Ben, and could be arguably the best actor in the film (shocking I know). Finally, all the actors are wearing too much makeup and have too clean of clothes for anyone to believe that they are living as pioneers out West. This area of the film could have been improved by removing Landon Jr.’s influence over the casting and hiring someone who actually knew what they were doing. In conclusion, because of all the glaring errors here, this movie deserves a remake. The original book content is worth it. For starters, Janette Oke should be a part of the filmmaking, especially the casting. The screenwriter should use the content in the book and make very few alterations. Michael Landon Jr. is obviously not the right person to make movies from books. Christian authors, beware. Yet, with the right person(s), and inclusion of Oke in the filmmaking, this movie could change the older generations’ perspective on romance plots. Oke had a gift for appealing to all the generations and creating diverse characters; her content should not be ignored just because Landon Jr. ruined it. Much like other movies that need renovations, Wildflower has a very professional production. As expected, the only issue that needs improvement here is the editing, as it is quite choppy. However, this is related to the plot, so if this had been rectified, the production would have been nearly perfect. Wildflower is one of the most frustrating plots to witness. It is billed as a unique psychological thriller, and at first, it seems like it has a lot of potential. However, the more it goes on, the more disappointing it becomes due to narration and overly obvious elements. The mystery factors and intended elements of surprise are crippled by the poor presentation of the story. It tries to become too complicated and involved without properly developing the characters or even what the psychological concept behind this plot is trying to convey or model. For example, the flashbacks\dreams of the protagonist are intriguing, but what about other elements of trauma? In a similar vein, the antagonist of the story is too obvious, and the scope of the psychological elements are too limited. Also, the artistic elements of this film are creative and interesting, but there are times when the plot gets lost in them. This plot could have been greatly improved with a more well-charted psychological journey without narration, in order to preserve the element of surprise in the plot twists. A more pertinent study of the effects of trauma and causes of dissociation would have made this movie a lot more realistic. Of course, allowing the characters to develop naturally through substantial dialogue and flashbacks is always a must in a psychological plot. Finally, the actions and motivations of the characters need to be better explained without so much reliance on coincidences and vague ideas. There was tons of potential here; it just needed to be better developed. For the most part, this cast was very professional, even with a fairly difficult script to work with. Much like the plot affecting the editing, improving some of the dialogue would have likely improved some of the lines that the cast members didn’t have much to work with. However, there were some underwhelming moments that could have been improved, as well as some overly dramatic sequences. We absolutely need more psychological thrillers in Christian film, but they need to be well-constructed, well-thought-out, and well-researched. Trauma and dissociation are great topics to explore, but they need to be grounded in reality and not vaguely presented. Also, narration rarely helps a movie, and the motivations of characters need to be demonstrated through deep dialogue and engaging flashbacks. Moreover, we believe that Nicholas DiBella has tons of potential as a film maker and will continue to improve in his career. Movie Renovation: Do You Believe? Much like other newer, more mainstream PureFlix releases, Do You Believe sports professional production quality with very few errors to speak of. Naturally, due to the nature of this film, the editing is mostly a mess as each scene tries to be a dramatic climax with no resting periods or relief scenes. Thus, the only issue with the production can be rectified by improving the plot. Much like God’s Not Dead, Do You Believe takes on far too many subplots than it can handle. Easily half of them are unnecessary, as each of them try to insert a dramatic turn into nearly every scene that comes up. The paramedic subplot is mostly unrealistic and unnecessary, and its deletion would have also rendered the Andrea Logan White\Sean Astin subplot useless. The military veteran suffering from PTSD and the girl with the unknown past who tries to commit suicide belong in their own film, so they can be developed better as characters. The criminal brothers subplot is awkward and stereotypical. With the removing and reassignment of these subplots, the more pertinent elements of this storyline, namely the older couple who helps the homeless mother and daughter and the pastor and his wife who help the young homeless mother, could have been given more room to grow and be developed beyond their current state. An alternate option to improve this plot would have been to start at the mass car accident scene and then work backward by following each character’s path to the accident, but this would take a lot of skill and discipline. Also, the narration has to be totally eliminated. In short, there is so much content in Do You Believe that there is bound to be potential in here somewhere. While there are some good elements to the acting of this film, most casts would be improved in the absence of Liam Matthews, Andrea Logan White, and of course, Ted McGinley. There are just so many cast members involved here that any good portions are cancelled out by poor performances. However, if the storyline was pared down to a realistic medium, the cast would have also been trimmed to ensure quality of quantity. Quality over quantity was truly the order of the day for this film. Dumping every subplot you can think of into one film will make a film that a lot of people will see and perhaps like momentarily, but its lasting impact is blunted by its onslaught of content. However, there are enough good ideas in this film to perhaps kickstart a better film in the future. For starters, like most films that need remakes, Where Hope Grows has a poor budget allocation. The camera work needs a total rework, and the presence of a substantial soundtrack would have also helped things along. Post-production elements, such as editing, also need to be renovated, as the way the plot is presented is a bit disorienting at times. Overall, this film had a very indie feel to it, which is not always bad, but the lack of proper funding crippled this film’s full potential. The plot of Where Hope Grows also has some work to do. There is a disproportionate amount of time spent on the woes of troubled characters. Although this is a realistic approach, it’s not always done in a tasteful way. This is billed as a family film, but the audience therein will likely be disappointed by the slightly overdone amount of edgy content that lacks a proper amount of redemption to help things. Also, even though the characters are realistic in many ways, their dialogue needs deepening in order to assist the audience in relating to them better as people. For example, some flashbacks could have aided us in understanding the motivations of the characters rather than having another scene of the main character acting drunk. Also, as previously mentioned, the disorganization of this plot is a drag on the experience and blunts the full impact of the otherwise good ending. Essentially, a total rewrite of this plot by the right person could have put this film on the Hall of Fame. This film’s important message regarding special needs people is reinforced by the excellent casting of a special needs actor. Though there are some overly heated emotional moments that could use some toning down, this section is overall the most reliable section of the movie. Where Hope Grows was closer to greatness than a lot of films with twice its budget. This level of commitment to raw, imperfect characters is hard to come by in the plastic Christian market. However, there is a balance to find between extremely fake and extremely realistic. Perhaps a future Christian film maker can use this film as a model for how to walk the line between the two in order to make a truly dynamic film. Obviously, the portion of A Cross to Bear that suffers the most is the production. The production quality is very low, and this is manifested in poor video quality, below-par audio quality, and unprofessional camera work. Though the sets, props, and locations are mostly good, the overall feel of this production is very low-budget and indie. Thus, it is easy to point to these production elements that need to be improved and how to improve them. Basically, a higher budget, combined with good stewardship, would have gone a long way to possibly making A Cross to Bear a Hall of Fame film. While the plot is surprisingly the strongest point of this film, there were a few things that could have been done differently, such as deeper character development. More opportunities for dialogue could have been taken in exchange for removing a few of the ‘training’ montages. The struggles of these characters were clear and easy to relate to, so a little more work in this direction could have gone a long way. The acting of this film also has a higher rating than the production, even though there are a few amateur elements here. There is some coaching evident, but there are a few moments that seem over-acted and some that seem under-acted. As a whole, with a few small tweaks, this cast could have been nearly perfect. Movies like A Cross to Bear are extremely rare in that their plot and acting quality are better than their production quality—this is a total role reversal from most Christian films. What it comes down to is that A Cross to Bear needed a higher budget to succeed past its original rating. Had it had the budget of some films half its rating, it could have a place on the Hall of Fame now. Nonetheless, perhaps the ideas of this film could be translated to an upcoming feature. Also, as we mentioned before, Lecrae needs to be in more films! We will be hard-pressed to find a more impressive internal suspense and action-based production in Christian entertainment than the last installment of the first attempt at bringing the Left Behind trilogy to the big screen. The production of World at War is not only actually well-funded, but it is also well-utilized. We analyzed that the only main issues with this production were some editing problems, which are to be expected. Otherwise, there is little else that can be improved in this portion. World at War completely departs from the original Left Behind novel narrative, which is a fact that is its greatest asset. Actually, the fact that this movie is stuck in the Left Behind saga basically holds it back from being Hall of Fame. Were this film transported outside of the Left Behind universe, it would suddenly become an epic suspense action film worthy of a high rating. The concepts in this film, such as the intrigue surrounding the pandemic spread, are more creative than Left Behind ever was. Also, the complex and non-typical characters who do not appear in the original book series, such as the President character and the character who leads the resistance, are better than the original Left Behind characters. However, these more creative characters and subplots have little to no buildup from the first two movies, which is a fact that hurts their full impact. This even more speaks to the necessity of having this movie exist outside of the Left Behind universe. Also, the ending of this film is very creative, epic, and shocking, but it has no follow-up. However, perhaps this idea can be extrapolated into a better film in the future. The original cast of this film was mostly professional and well-cast. 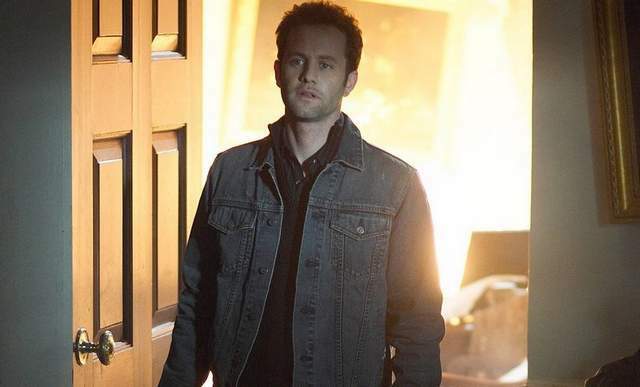 There are few errors here, but a cast would always be better without Kirk Cameron. Otherwise, there aren’t many major improvements to be made here—only small issues that add up. This rounds out a very close effort. It’s possible that World at War is actually the film that made it the closest to the Hall of Fame without actually making it on the list. In reality, only one single thing needed to be done to push it over the edge, but that thing (isolating it from the Left Behind saga) could have possibly caused it to cease to exist. Nonetheless, the concepts and ideas presented in this film can and should be used in later films to boost a suffering action\suspense genre in Christian entertainment. In keeping with most Worldwide Pictures films, Road to Redemption has a high-quality production, especially for the time period it was made in. There are no issues to point out here except for the use of cheesy special effects that try to accompany the eccentric genre of the film. However, if these small issues had been eliminated, then Road to Redemption would have had a perfect production. Road to Redemption is clearly a comedy, and it’s a pretty good one at that. It’s also quite a departure for a typical Worldwide Pictures film, which is great. However, sometimes the comedy is a bit cheesy, unless it is read in the context of satire, which is unfortunately unclear. Some parts seem to be included just to be eccentric, and thus the satire is not clear enough. For example, what’s up with the mafia subplot? It’s funny, but is this supposed to be serious or not? Also, character development is a bit lacking in some areas, and this is a needed element in any comedy. We need some more back story from the main characters beyond their representing of typical family issues. Finally, the ending too easily resolves the conflicts in unrealistic ways. Thus, had comedy been more rooted in reality, had the satire been clearer, had the characters been developed better through personality-building dialogue, and had the ending been less unrealistically patched up, then Road to Redemption could have been a Hall of Fame film. Much like the commitment to high-quality productions, Worldwide Pictures also always demonstrated a commitment to high-quality casts. They were one of the few independent Christian film groups who seemed to employ acting coaching. However, there were some opportunities for improvement in Road to Redemption, such as Jay Underwood in general, who plays Alan. His delivery and emotions are annoying and whiny. If his character was written like that, then it needed to be changed. Also, the mafia cast members are a bit cheesy at times. In the end, there were just a few minor issues that held Road to Redemption back from being all that it could be. With minor production errors eliminated, with a clearer comedy premise more based in reality, with a more effective use of satire, with deeper characters, and with a slightly better cast, Road to Redemption could have found itself on the Hall of Fame. 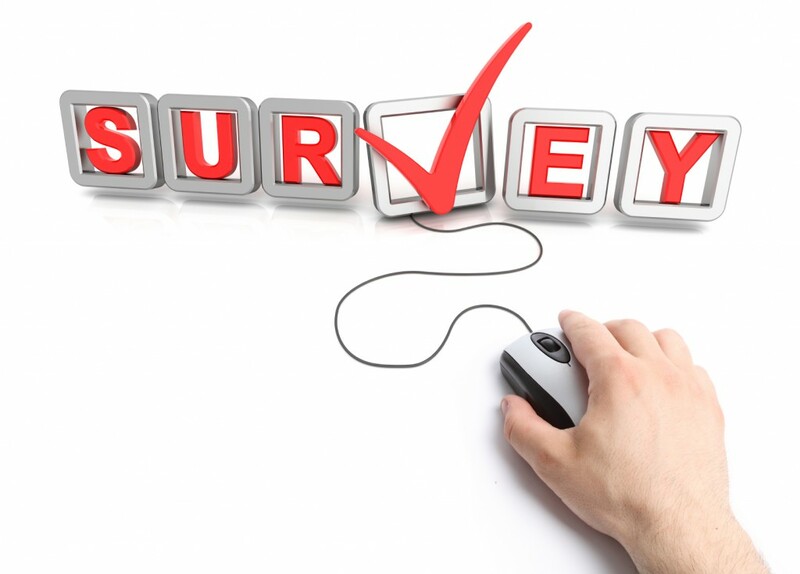 However, perhaps someone can use the feedback here to make a better version one day. There are really few production errors to note in the first God’s Not Dead film. The primary issue with this production is, of course, the editing, due to the large and complex amount of content that is attempted to be used in this film. Thus, if the plot categories were improved, the editing issue would likely also improve. The plot of God’s Not Dead needs some serious work. For one, there are too many ideas shoved into one two-hour film. A lot of these ideas really need to be movies of their own, such as the Muslim family subplot and the Chinese student subplot. The blogger character and all of her connections (Dean Cain, the Robertsons, etc.) need to be deleted completely. The woman with dementia is an interesting aside, but it needs better development. Pastor Dave and his connections really wouldn’t be missed either; this area might be better if it was altered. Finally, the portrayal of the atheist professor is noteworthy and better than most, but it still could be better and less over the top. The “character who is an atheist because their mother died of cancer” trope is a bit thin. Also, there are obviously instances of anti-Christian bias in academia, but this story could have been a bit more down to earth. Thus, with a lot of separation, editing, organization, and focus, this plot could have pushed the film into the Hall of Fame. While the acting of the original God’s Not Dead is actually a major improvement over most PureFlix casts, it still isn’t perfect. For one, David A. R. White and Tommy Blaze rarely need to be acting. Trisha LaFache is average at best and needs serious coaching. Dean Cain should probably never be cast again. Kevin Sorbo has his place, but not as a raging professor. Otherwise, this cast is fine. There was a reason the beginning of the God’s Not Dead saga was so popular, and it wasn’t because of its portrayal of atheists. It has a lot of intriguing content and a lot of ideas that need further exploration in different venues. Trying to lump all of it together in one film was a disappointment. However, it was the first time PureFlix actually proved they could be at least somewhat responsible with their budget, including a high-quality production. Perhaps one day someone will use some of the half-baked ideas of God’s Not Dead for greater purposes. One of the biggest production annoyances with Hardflip is that too often, it feels like one long Decypher Down music video (oh the good ole’ early 2000s). However, there is a healthy dose of Red that helps things. Nonetheless, though this movie was marketed as a music-filled experience, this is just too much. The music is too loud most of the time, and it thus hampers the film’s potential. Two main things that would make this production higher are to cut down the music to a more palatable amount and to bring the schizophrenic editing up to industry standards. These two fixes would have gone a long way in pushing this film closer to the Hall of Fame. The music overload also undercuts the plot’s ability to truly flourish in this film. There are a lot of creative artistic undertones in Hardflip that do not reach their fullest potential due to the wild and dizzying presentation of the plot events. Thus, some organization was in order. The psychological elements of Hardflip are a plus, but they need better development. For example, the asides with the homeless guy are interesting, but we need to be better connected with this subplot. Also, as with most films, improved characters via more complex and meaningful dialogue would have gone a long way to increasing this film’s overall score. Thus, with fewer music videos, a more responsible use of artistic and psychological elements, and stronger characters based on realistic dialogue, Hardflip could have been a Hall of Fame film. John Schneider and Randy Wayne are a shaky lead role combo at best. If Caleb is supposed to be a teenager, Randy Wayne looks too old. 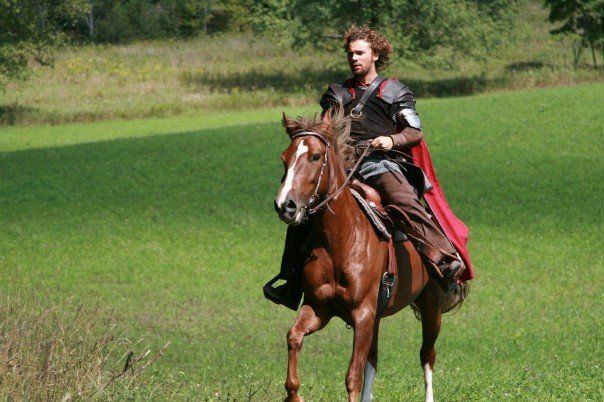 John Schneider has shown that he is a product of his directors, so some better acting coaching was in order here. The supporting cast members could also use some upgrades. In short, better casting and acting coaching always go a long way. Johnny Remo has always been close but not quite there in his films. Hardflip was possibly the closest he has ever gotten to true greatness in film making. He had great ideas here that, with further refinement, such as a more professional production, a more responsible use of music, a more organized plot, and more refined acting and casting, could have been a Hall of Fame film. We may never know the fullest potential of this movie, but perhaps future film makers can learn from Hardflip to make their films even better. Pendragon: The Sword of His Father was one of the most under-funded productions that showed the most potential. Thankfully, this potential was fulfilled in Beyond the Mask, but there were some things that could have improved Pendragon. In many ways, it seems like Pendragon was filmed over a long period of time, with each part of the movie having a different level of production quality. Despite the very low funding, the Burns family did their best to make the most out of what they had, which is all we really ask for. For example, the construction and engineering of the complex battle sets and props was impressive. However, video quality and lighting were very inconsistent throughout, and a lot of the audio quality was reworked in post. Essentially, all this production needed was better funding, which the Burns family had in Beyond the Mask, so they followed through on their potential. Pendragon is one of deepest and most complex plots we have ever reviewed, especially since it was based on a long historical account. Unfortunately, the Burns were forced to cram almost four hours of epic content into two hours, which was still an impressive amount of time for an indie film. Even so, we feel like Pendragon could have been a two-part miniseries had the funding been there. The characters barely reach their full potential, and their epic journey across time is barely captured in this limited window we are offered. There is so much more that could have been done here if the budget had permitted. The first part could have been about the captivity of Artos and his escape, while the second part could have focused on his redemption. There are so many possibilities here, so maybe one day, we will get a remake? Unfortunately, the casting and acting is by far the biggest detractor of Pendragon. Obviously, cast options were limited, so their hands were tied. The good thing is that casting got a major upgrade in Beyond the Mask, including the employment of an acting coach. Still, if Pendragon were remade, we would need an entirely new cast. As a side note, however, Marilyn Burns is a great costume designer. The Burns family followed the indie film model perfectly: they began with an under-funded production that was rescued by a deep and complex plot and were given a greater opportunity to go further in Beyond the Mask. Now, all that’s missing is a follow-up film (wink wink). They are a creative team with loads of potential, just waiting to break out. If they are ever offered a full theater release and distribution contract, then Christian film will never be the same again. The only major production improvement that should be noted in Meant to Be is the need for more organized editing. In this film, scenes tend to be tossed here and there in a confusing fashion. However, the editing can only be improved as the plot content is improved. Thus, a more organized plot would have likely led to improvement in this area. 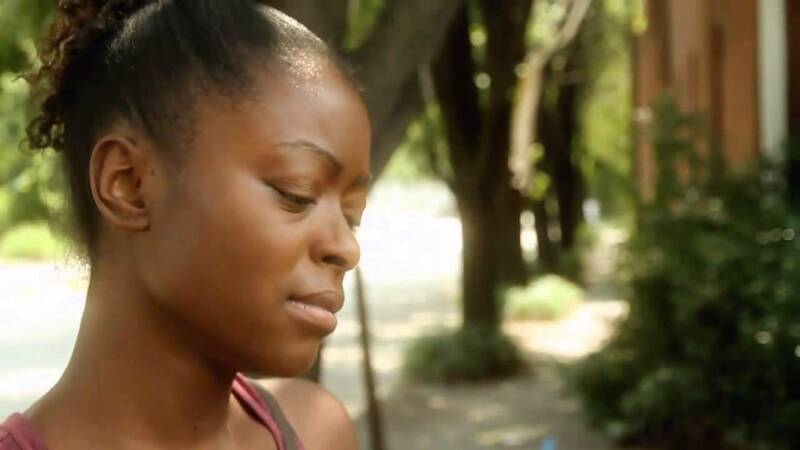 Meant to Be is one of the most creative and most frustrating films we have ever reviewed. Without spoiling the major twist at the end, it should be noted that this twist is mostly unexpected, especially after sitting through the boring and purposeless first half of the plot. This is where most of the audience will be lost, so the most effective thing that could have been done in this situation would have been to make the first half of movie a good film on its own without having to rely on the twist in the second half. This would also cause misdirection and make the twist even more surprising and out of left field. As it is, Meant to Be seems to be rushing to get to the twist, and character development is sacrificed in the process. We need to know what these characters care about and what their motivations are, and this can be done through substantial dialogue. If these characters would be able to stand on their own apart from the twist, this would have been a truly great film. Step one: take out Dean Cain. Further, the jury is still out on whether or not Bradley Dorsey should be acting in his own films. Other cast members in Meant to Be were underwhelming in their performances, so more improved acting coaching might have helped this section improve. Bradley Dorsey has some great ideas, but he often stunts their full impact by getting in his own way. The best thing he can do at this point in his career is to work with a team approach. He may need to step back from acting in his films and work collaboratively with someone to bring his creative ideas to full fruition by developing deeper characters. In the end, while it is unclear what his next steps are, if he heeds this advice, he could soar to new heights. In our time as film reviewers, we have noticed a growing collection of Christian films and series that were almost there, but were held back by one major error or by a collection of small ones. Thus, it is incumbent upon us to revisit these films and detail specifically where they went wrong and how they can be Hall of Fame films. This is done by outlining the various Production Improvements, Plot Improvements, and Acting Improvements that we feel would have caused the film’s (or series’) rating to rise to seven points or above. While these films and series may never be remade, future film makers can still take note of these opinions, which will hopefully improve their work.